Hey, so I wanted to make a fried chickun and waffles recipe using my air fryer. I based the recipe off of this and this, but made several big tweaks to them. For the chickun, I used Gardein chick’n scallopini, and I didn’t have the Follow Your Heart vegan egg so I used Ener-g and added more ingredients to make it taste better, among some other changes, such as using beer and changing the spices to suit my tastes better. For the waffles, I used less (not gluten free) flour, almond milk yogurt, avocado oil, and changed the method a bit. It was SO AMAZINGLY GOOD! OMG. I’m hoping to be back on my blog a lot more now that I’m in a good place with my humane education master’s degree program, so keep a look out for new posts! I know I often say I’ll be posting more frequently and then never end up doing so, but this time I think I mean it! 1 package of Gardein Chick’n Scallopini, slightly defrosted, just enough to be able to cut in half, not enough to be mushy. Start by making the chickun first. In one bowl, mix together the dry ingredients. Mix together the egg replacer, water, black salt, nutritional yeast, and turmeric. In another bowl, add the egg replacer mixture into the rest of the ingredients for the wet mix. Slice each piece of scallopini in half vertically. Coat the scallopini pieces in the dry mix first, until each piece is coated. Place on a plate or tray. Add 3 tbsp of the liquid mix into the dry mix. Coat the floury scallopini pieces in the liquid, then place them into the wetted dry mix until covered. Put them back on the tray or plate and place in the fridge while you start preparing the waffles. Add the apple cider vinegar to the almond milk, stir, and let sit for 5 minutes. Meanwhile, in a large bowl, stir together all the dry ingredients. When the almond milk and vinegar is done, pour the mixture into the dry mix, along with the oil, yogurt, and vanilla. Stir well. The mixture will look clumpy, that’s totally okay. Place the coated chick’n scallopini into the air fryer basket in a single layer. Heat at 400 degrees 4, for a total of 10 minutes. Check on them and shake the basket after five minutes of cooking. You may need to cook in batches if your air fryer is small like mine is. While the chickun is cooking, place a good amount (depending on your waffle iron) of batter after spraying the iron with coconut oil. Cook according to the instructions for your waffle iron. Keep waffles in a pouch of aluminum foil until ready to serve. Serve with the chickun atop the waffles with maple syrup and vegan butter if you like. Bon Appetit, don’t eat your feet! I basically honed my baking skills as a kid by making chocolate chip cookies from an alphabet cookbook for kids. It was the only recipe I used, and they always came out perfect. I thought my mom had thrown out the cookbook, but I recently found it and I had to veganize them and make them gluten free. The result was so perfect I was astonished! Whisk flaxmeal with water in a small cup. Let sit and whisk several times until gelled. Mix together the sugars, melted Earth Balance or coconut oil, and flax egg. Stir in flour and baking soda. Form dough into small balls and place onto an ungreased cookie sheet. The recipe should make about 24 cookies. Let cool and place on a cooling rack shortly after they come out of the oven. Enjoy ! I know I will! Vegan and Gluten Free Pizza Waffles! But here are the pizza waffles. And here is the recipe for them! Pour the gluten free pizza dough flour mix into a large bowl. Mix in the Italian herb blend. In another large bowl, mix together the yeast and warm water in a large bowl and set aside for five minutes until the yeast dissolves. Prepare the egg replacer, also let sit while the yeast is dissolving. Place the oil and egg replacer into the yeast and water and whisk. Pour the flour mixture into the yeast mixture and stir until well combined and a dough forms. Cover and let sit for twenty minutes to rise. Warm up your waffle oven and turn your oven to 350 degrees F.
When the dough is ready, spray the waffle iron with oil and place some dough into the iron…pat down and don’t use too much dough, as I had trouble sometimes flipping over my iron. If that happens, it’s okay, you can still make them, just keep it upright and let it cook inside at a medium temperature for about 4-5 minutes before taking out. Place your waffles on a greased oven tray. Make the sauce by mixing together the crushed tomatoes, sugar, hemp seeds, nutritional yeast, and salt and pepper. Place some sauce on top of each waffle. Cove with cheese and desired toppings. I am slowly making my way through the backlog of stuff I’ve been meaning to post! Soon you’ll also get to hear about a delicious raspberry cake batter smoothie I made and adventures in vegan Ethiopian cooking (a cookbook review). Not too long ago I really wanted some comfort food, and I had been contemplating using the block of Daiya cheddar cheese I had in my fridge for poutine for awhile. So, I finally did it. The gravy was spot on, but next time I will melt the cheese a little bit more on top of the fries in the oven so that when I pour the gravy on it all it will melt even better. Start by preheating the oven to the temperature the fries are baked at. Prepare fries according to package…in the meantime prepare the gravy. Melt the butter or coconut oil in a large saucepan. Add the flour and stir constantly until a roux is formed. This is when it turns into a golden brown color. It takes about 5 minutes. Add in the garlic and cook for about 30 more seconds. Stir in the broth with a whisk. Whisk in the cornstarch and water, stir constantly and let simmer until thickened, about 3-5 minutes…it’s possible you might need slightly more or less cornstarch. I started with 2 tbsp water/cornstarch and then added the extra 1/2 tbsp later when it would not thicken to my liking. Keep gravy warm (this can be done by turning off the heat and covering, leaving on the stovetop that you cooked it on. In the last few minutes of cooking the fries, gather them up into the middle of the tray, and randomly drop the Daiya cheddar blocks on top. I’d say only do this for 5 minutes at maximum but do it however you like really. Take the fries and cheese out, place in a large bowl, and put as much gravy as you like, I probably put close to 4 cups on top. You will have extra gravy that you can use for more poutine or something equally delicious. Maintenant, nous mangeons! (That’s French for now, we eat!) Enjoy! 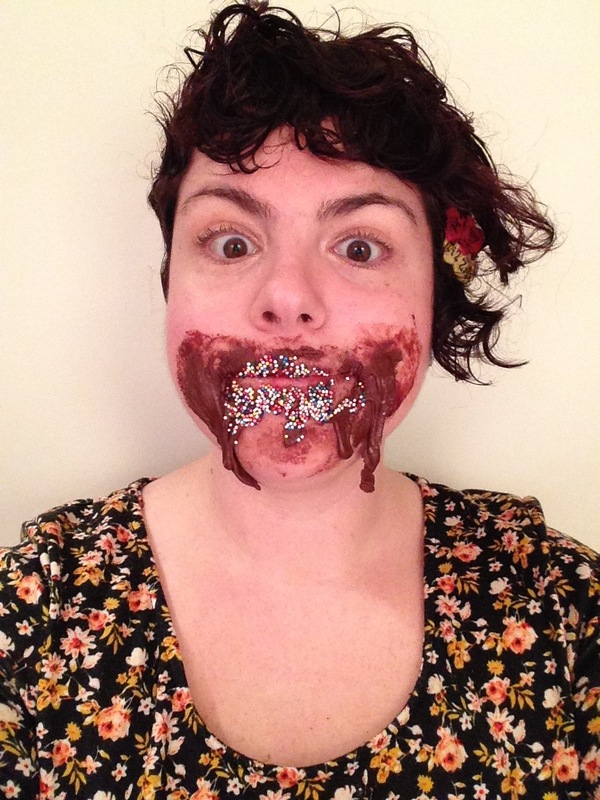 I’ve been wanting to make a vegan chocolate cream egg since…well…every year I’ve been vegan. This year I finally decided to take action. I bought an egg shaped mold from a craft store and everything. However, I found a recipe on one of my favorite blogs, Hell Yeah It’s Vegan which does not require a mold (and I think comes out better if you don’t). 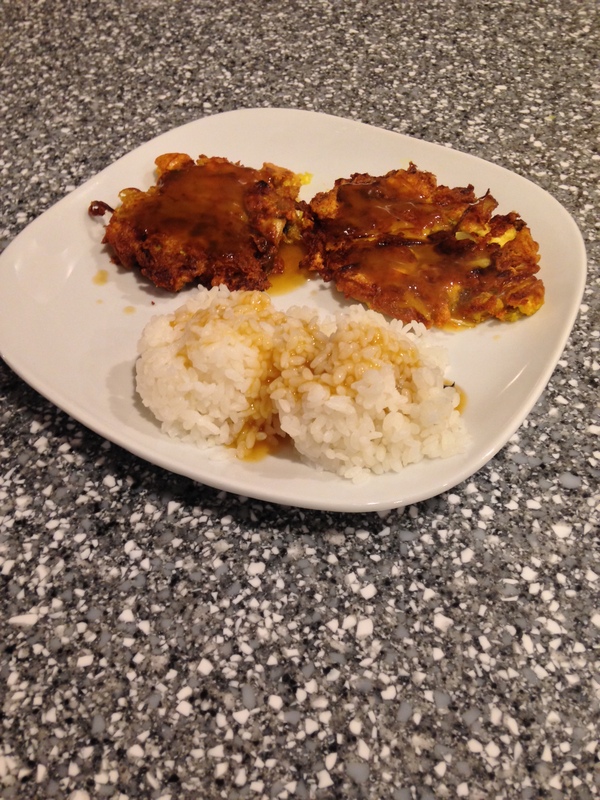 Please check the blog out beyond this recipe. It’s amazing! Originally I just made some simple adjustments to the recipe. Instead of using yellow and red food coloring, I made the yellow out of water and powdered turmeric. I also changed the method a bit, instead of using two disks I used one and just free-styled the yellow part of the egg by placing it in the center and wrapping the white part around it and shaping it into an egg shape. 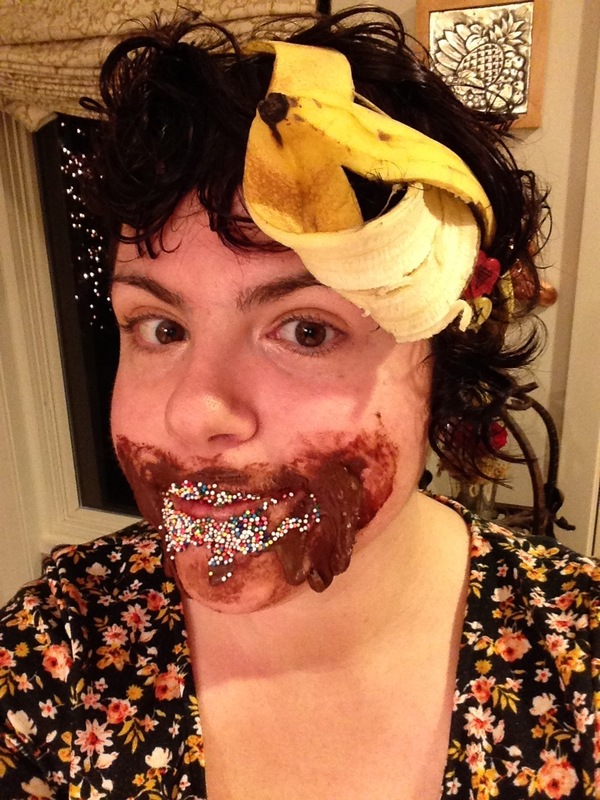 It was actually really easy in terms of making candies and other stuff. The chocolate I used was Equal Exchange Fair Trade chocolate chips which I am really passionate about buying from now on. Not only are they conflict/child labor/slave labor free and on the Food Empowerment Project chocolate list, but they’re also the best tasting chocolate and worked like a dream. But I was annoyed that I was making these with Earth Balance, which has palm oil in it, and corn syrup, which is often gmo and not organic (genetically modified). So I had to totally revamp the recipe. It works just as well if not better. The updated recipe is below! In a stand mixer, cream the brown rice syrup, coconut oil, vanilla extract, and water together. Slowly incorporate the powdered sugar into this mixture, blending until well combined. If it is hard to mix add a small amount of water, no more than an 2 additional teaspoons. Place a small amount of the mixture into a small bowl (a third or less of it), and sprinkle the turmeric powder and a small amount of water (you do want this to get a little runny), use a small whisk or spoon to stir it together until it all incorporates and is a bright yellow color. It will be hard to combine at first. Cover both bowls and place them in the refrigerator for an hour or more. If you are short on time you can place them in the freezer for no more than 30 minutes. Cover two cookie sheets with parchment or wax paper. 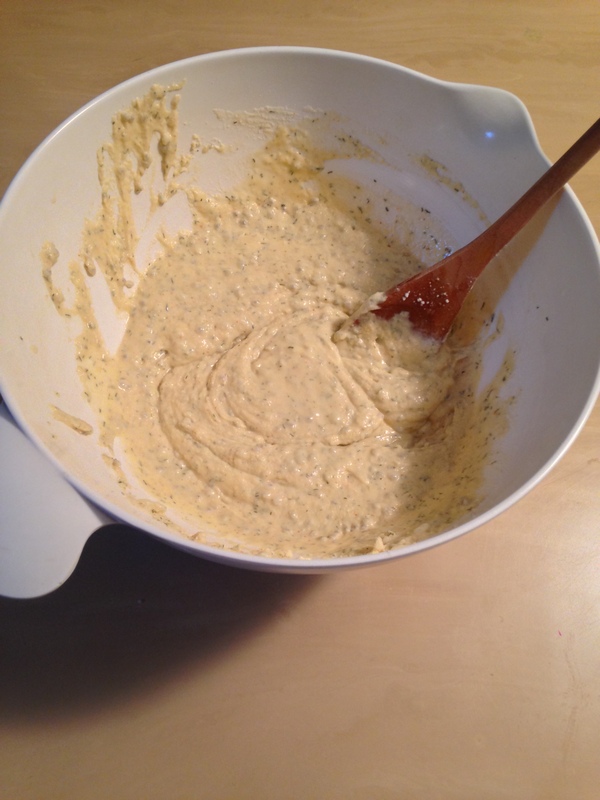 With a small spoon, place little blobs of the yellow mixture onto the tray. You want to aim for about 15 nickel size pieces. Then shape the white mixture into 30 flat egg shaped discs and place on the other tray. Place the white ones in the fridge and the yellow in the freezer for 20-30 minutes. Take one white disc, place the yellow blob and put it in the middle, then place another white disc to form a sandwich. Smush together and then shape by rolling in between your hands into an egg shape. Continue on with the rest of them. It’s okay if some of the yellow is oozing out, it gets better looking results that way. Place again in the freezer for a half hour (or more). Melt the chocolate with 2 tsp coconut oil in the microwave or a double boiler. Dip the frozen eggs fully into the chocolate one by one, placing on a cookie sheet with a fresh sheet of parchment paper or wax paper to set. I have found that the best method is to use a spoon to roll the egg in the chocolate and then carefully take out of the chocolate, letting the excess drip off back into the chocolate, and then placing onto the tray. They will not be perfect, you may have some drips that deform the egg shape. Once you let them set you can break those off a little bit. Place in the refrigerator or freezer to set fully. I like to keep a big batch of them wrapped in foil in the freezer, and when there is a day that I want one, I place it in the fridge for a few hours, let it sit out for a little longer at room temperature, and then dig in! They are so good. When I was younger, my mom used to make a non vegan version of this that I loved. Every time she’d make it, she would say “Saffron and Garlic Aioliiiiii” all long and drawn out in a funny voice and it made me have fonder memories of it. It leaves you with horrible garlic breath, but is worth it. Trim the ends of the asparagus off. Place in a baking pan with oil spread or sprayed on the bottom. Spray the tops of the asparagus with oil as well or use a couple teaspoons of oil if you don’t spray. To prepare the aioli, place the vinegar, agave, and saffron in a saucepan and bring it to a boil on medium heat. Allow the vinegar to cool in the refrigerator. Stir the garlic together with the Just Mayo. When the vinegar mixture is cool, mix together with the mayo and garlic. Dollop the aioli over the asparagus. Enjoy! It also makes a yummy dip for other veggies and such. During Christmas, I had this bad habit of being at the grocery store and looking at the ingredients of the Italian Christmas cookies hoping some of them would be vegan. Not a chance. I’ve been craving these all season. After Christmas, I looked up some recipes for this type of cookie. I wasn’t sure what they would actually be called, but it was easy enough to find. I found this recipe, which I knew I could veganize with the magic vegan ingredient, aquafaba. I was so worried I’d really mess up making these a lot earlier on. The parts I thought would fail were not as difficult as I thought. The hardest part was cutting it after I put the chocolate on top, which ended up crumbling a bit and making it not as pretty as I would have liked. The recipe makes it sound much more complicated and some of the steps are needlessly complicated, so I’m re-writing the recipe in the way I did it with the vegan substitutions. That is the first step to making these babies. In a food processor, blend the almonds until smooth and pasty. Add the powdered sugar, aquafaba, extract, and salt. Process again until smooth and dough-like (it should form into a big ball). You may need to scrape the sides down frequently throughout the process. When finished, set aside 3/4 cup for your Italian Rainbow cookies. You can save the leftovers, it’s super yummy! Place parchment paper on three jelly roll pans or rimmed cookie sheets and spray parchment with cooking oil. In a stand mixer bowl, place the almond paste and 3/4 cup with 2 tablespoons of sugar. Mix on the medium speed setting until crumbly. Cut the Earth Balance into small pieces and place into the the mixture while beating together until all the Earth Balance is in there and the batter is smooth. Sift 2 cups of flour and 1/2 teaspoon salt into a bowl. Add into the mixer slowly and continue to mix until combined. Do not over mix. In a large metal bowl, using a handheld electric mixer, place the 12 tablespoons of aquafaba. Whip until foamy. Slowly add in the 2 tablespoons of sugar while continuing to whip on the highest setting. Stop when you have created firm peaks (if you take out the whisks from the meringue, and place them upside down, it will not drip down). Add 1/3 of the meringue into the batter and fold in with a rubber spatula. Add the rest of the meringue and mix until fully incorporated. Place the batter evenly into 3 bowls. 1 bowl keep plain, and then add green and red to the other two bowls. Transfer the batters onto their respective cookie sheets one at a time with a wet rubber spatula . My sheets were too big to be able to spread out the batter entirely, so I tried my best to make the most even shaped rectangles on each cookie sheet so they’d match up when layered together after baking. Don’t worry too much about it, you’ll cut the edges so they’re prettier when it’s all assembled anyhow. Just worry about making relatively even thickness rectangles for now. Bake for 4 minutes, rotate the pans around in the oven so that one pan is not on the bottom rack the whole time, and bake for another 4-6 minutes until the edges are slightly browned. Spread a thin layer of apricot jam on top of the red layer. Cut any excess parchment paper from around the white layer. Holding the bottom of the cookie with both hands, carefully line up and flip the white layer onto the red. Spread another layer of jam. Repeat step 13 with the green layer, but do not place anymore jam on top. Cover with plastic wrap. Place a clean cookie sheet on top to press down the layers. Place something heavy and even (like two cans on either side) on top of that, and place into the refrigerator for at least 4 hours. Take off the cans, cookie sheet, and plastic wrap. With a sharp knife, trim the uneven sides into a clean rectangle shape. Let sit for a moment or a few. Melt the chocolate chips in a double boiler or microwave. Spread over the top layer and sides with a spatula. Allow to set, and then cut into smalls squares. Place in a container and store in the refrigerator or at room temperature. Enjoy! I know I certainly will! Oh man, I messed up this time on Vegan MoFo towards the end. Just wasn’t feeling it as much. I think I would have preferred a theme I had chosen and developed a bit more. But, onward and upwards, so the saying goes? I have a new recipe to share. Also, I’m very tired from not sleeping well and having run a 5k race today. The other day I remembered egg fu young, and was like, “why haven’t I made this vegan yet?” so…I did. Mix all ingredients except cornstarch and water in a small saucepan over medium heat. Add cornstarch and water mix while whisking constantly. Continue to whisk until the gravy thickens. Cook all veggies all together with the sesame oil in a large frying pan over medium heat until soft and the mushrooms have become darker. Break the tofu block in half. Crumble one half into small pieces into the pan with the vegetables are in. Stir well. Place the rest of the ingredients in a food processor and blend well until it becomes a thick liquid batter. Fold into the vegetables and tofu, stirring well. To fry them up, I used an electric fryer that we use for making potato latkes because I thought it would work better than doing it in a frying pan. You can definitely do it in a frying pan though if you have one that doesn’t stick too much with this sort of stuff (I don’t). Heat the oil (you want about a half inch of oil or more) until some of the batter begins to sizzle when flicked in. Place large spoonfuls of the batter into the oil. Cook on one side and then flip when the side is browned. If not ready yet keep frying it on the side until it becomes crispy and brown. I would have tried to be more mindful of time, but it can vary so much depending on your equipment and your ability to keep the temperature of the oil stable. When both sides are sufficiently browned and crispy, place on a paper towel on a plate to soak up some of the oil and cool. 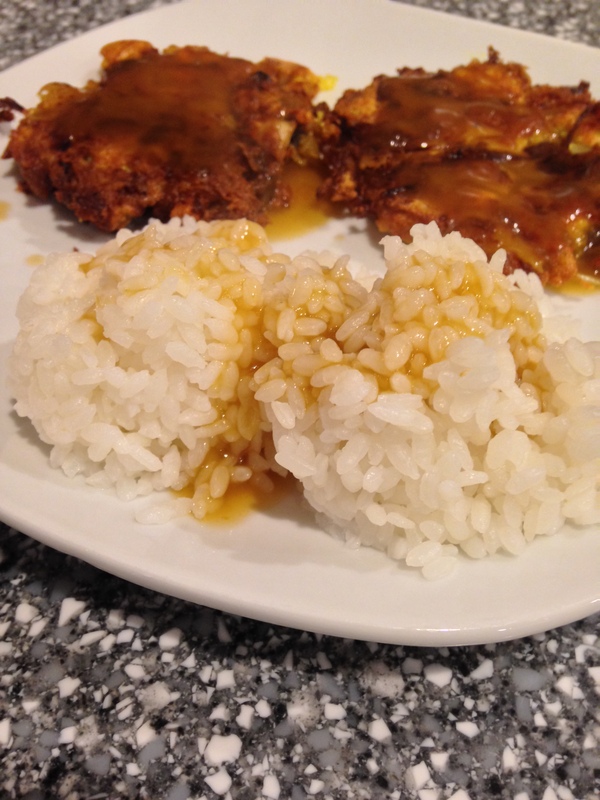 Serve with rice and the brown gravy. This recipe can be found in my zine, Childhood Favorites Veganized that you can buy on Etsy and see more recipes I veganized from my childhood and the stories behind them. According to my mom, this was my great grandmother’s “signature” cookie. Doesn’t quite have the same effect as the childhood photos, haha! Dip a fork in the sugar in the bowl. Press down with the fork onto the ball of dough, making an imprint. Repeat in a criss-cross pattern. Bake in the oven for 10-12 minutes. 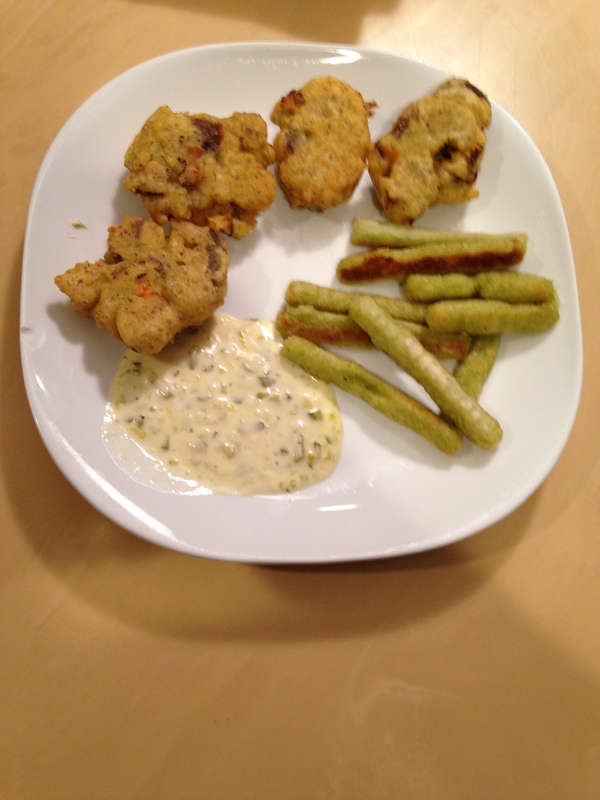 Vegan MoFo Day #17, Post #13: Make (or eat) a traditional local dish: RI clam cakes veganized! Today I decided to veganize a Rhode Island (my home state) favorite seafood snack, the clam cake. According to Wikipedia, “Clam cakes, which can also be called clam fritters, are a New England food, most commonly found in Rhode Island.” I didn’t really eat these before going vegan, but from what I know, these are not a “cake” in the way you’d think of a crab cake or whatever (which can also be veganized–check out this recipe I love). They are more like a fritter or even a weird type of fried donut. 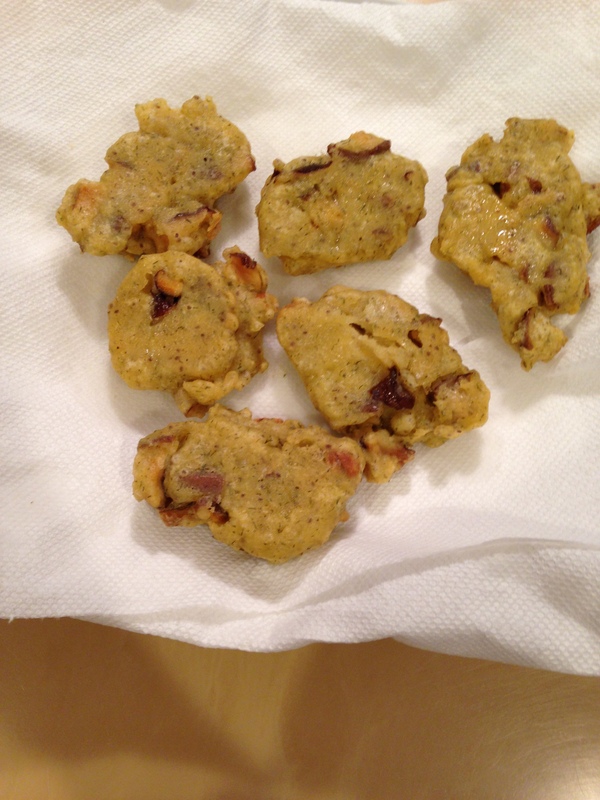 I made these with dried reconstituted shiitake mushrooms in place of the clams. They were pretty darn good! I served them with some vegan Tartar sauce (relish and Just Mayo), and my favorite new thing: Broccoli Fries, They’re french fries with broccoli in them. I threw out the bag and the trash went out so I can’t tell you the name of the brand that makes them currently…I’ll try to remember to share this some other time. 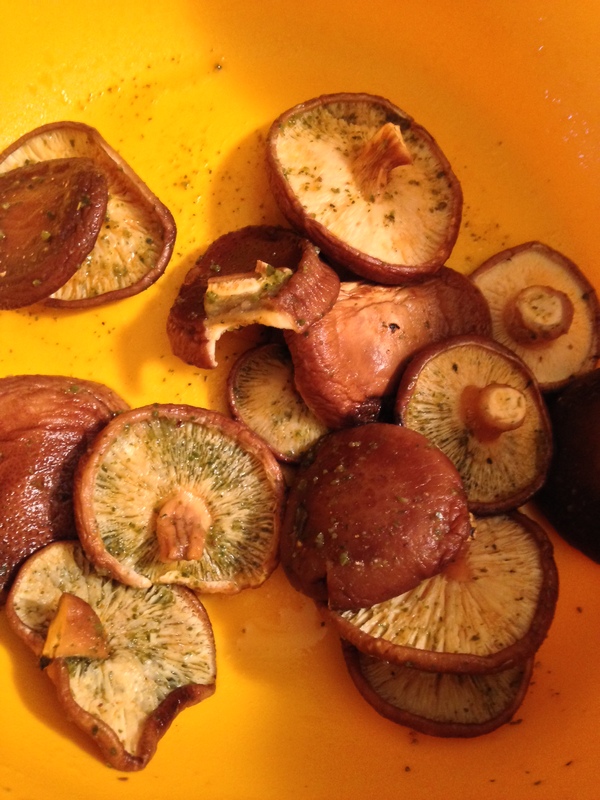 Reconstitute the dried mushrooms by placing in a medium sized bowl. Pour the water and broth over them. Stir in the kelp granules and Old Bay. Let sit for thirty minutes. In the meantime, mix the dry ingredients in a large bowl. Prepare the chia seeds and water mix, whisking several times, and let it sit until the mushrooms are done. When the mushrooms are moist after 30 minutes, drain in a strainer. Don’t rinse them off or anything, you want the seasonings to remain (I almost did that out of habit). 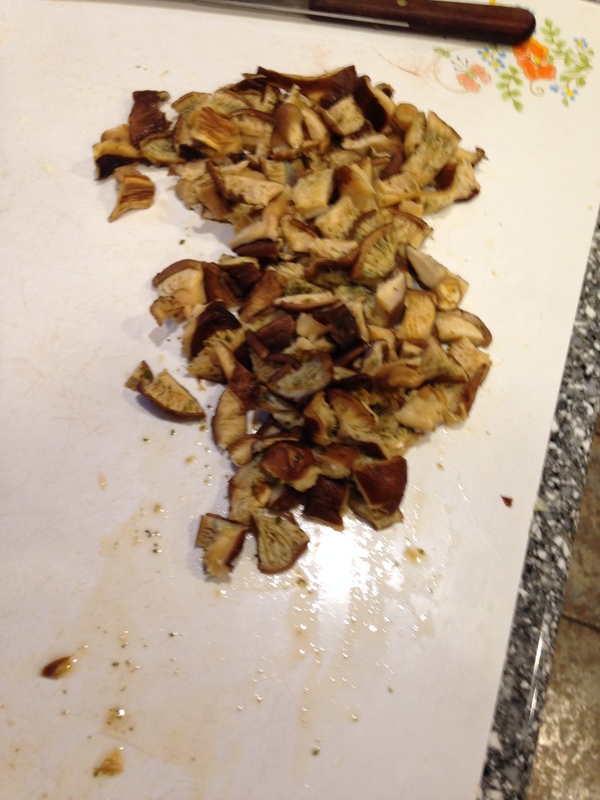 Cut each mushroom into thin strip. You probably want to cut those in half as well, but that’s up to you. Add the chia water mixture, lemon juice, and light coconut milk to the dry ingredients. Pour about an inch of peanut oil into a frying pan/skillet with tall sides. Begin to heat the oil on high. Fold in the chopped shiitakes to the batter mix. The oil is hot enough when a drop of the batter immediately sizzles when placed in the oil. Set aside a plate or platter lined with paper towels to drain the excess oil and cool the cakes when done. Before frying the batter, turn the heat to medium, you will need to adjust this occasionally as you continue to fry them. Drop large spoonfuls of the batter into the oil.You will most likely need to cook them in two batches. Don’t get tempted to overcrowd the pan. Flip them over when the side facing the bottom of the pan is golden brown. They are ready when they are golden brown on both sides. Take each cake out with a slotted spoon so that you don’t get hot oil all over the place. Gently transfer to the plate with the paper towel, and allow to cool before serving. I haven’t gotten a chance really to look at many other people’s MoFos because of my workload lately 😦 But I hope to be looking a bit more this weekend *fingers crossed* If you’ve been participating with your blog, and you want me to check it out, be sure to comment on this post (and/or tomorrow’s) so I remember to look! Also, don’t forget to “Like” me on Facebook if you haven’t already! Or follow me on Twitter. And Instagram.